The emoji is one of 56 recently approved. 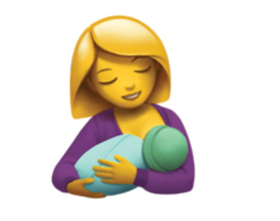 A London neonatal nurse thought there was something missing from the array of available emojis: one representing a mother breastfeeding. So Rachel Lee, who works at University College London Hospital, petitioned the Unicode Consortium, the not-for-profit corporation that sets global standards for emojis and other software. At the time there was just the baby emoji and one for a baby bottle. "If there was the baby bottle, there should be the other alternative," Lee told the BBC. In June, the consortium approved the emoji along with 55 others, including ones representing vampires, fairies, hedgehogs and broccoli. One health-related proposed emoji that didn't make the cut was for mosquitoes. A pair of public health workers in Maryland are seeking to add that one to the online animal kingdom, saying it could be used in communications campaigns and warnings by scientists and public health workers battling skeeter-borne diseases. The new emojis have been rolling out to smartphone users with software updates. Lee wants the new emoji to spark conversations. She told the BBC she hopes the emoji will "normalize (breastfeeding in public) a little bit, and hopefully allow society to see it in a different light. There are a lot of people who still have very negative things to say about that and think that women should be doing that behind closed doors and that it's meant to be a private thing."